Industrial racking design, supply, installation and maintenance, from the North’s warehouse storage system specialists. Every day, you’ll find us working across every part of the M62 corridor and beyond, designing, installing and maintaining the North’s industrial racking systems. Every project we tackle is different – in terms of scale, storage requirement, budget and new or used pallet racking equipment – so your project doesn’t have to conform to one of the above case studies. But whatever project you ask us to tackle, we hope the projects on this page demonstrate not just the scale and scope of what we do, but the care, attention and commitment to safety and compliance that goes into every stage. 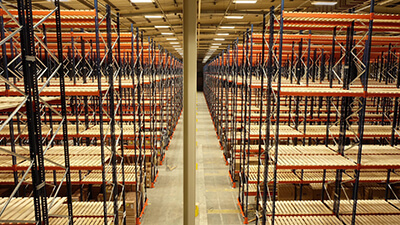 Let us help you make better, more economical space of your warehouse pallet racking. Talk to us about your project on 01422 300 644. We’ve worked with Barwick, the Bradford-based bathroom wholesaler, for several years, helping to ensure its industrial storage capacity has kept pace with its growth. But ad-hoc growth can leave your warehouse racking inefficient and uneconomical, so when Barwick decide to consolidate all its industrial racking in one purpose built facility, we set to work designing pallet racking, shelving and a mezzanine to fit Barwick for the future. Discover more about warehouse storage system project.